From a riotous Cillian Murphy DJ set and Villagers live album recording to a Jimi Hendrix film shoot with Andre 3000 and Royal Blood’s barnstorming first Irish gig, we’ve seen a whole heap of rock ‘n’ roll action since opening our Wellington Quay doors in 2010. Future Islands, Anna Calvi, Maverick Sabre, Dan Le Sac Vs Scroobius Pip, Kodaline, Damien Dempsey, Imelda May, Little Green Cars and Father John Misty have all played in our multi-floor venue, located at the edge of Temple Bar, beside the world famous Clarence Hotel. Run by people passionate about music, our venue welcomes performers of all flavours. Alongside the headline gigs, The Workman’s Club is home to some of the capital’s finest club, comedy, acoustic and new band showcase nights. The striking old-school decor makes it a popular choice for parties, launches, screenings, book readings and multimedia takeovers, as well as photo, video and movie shoots. 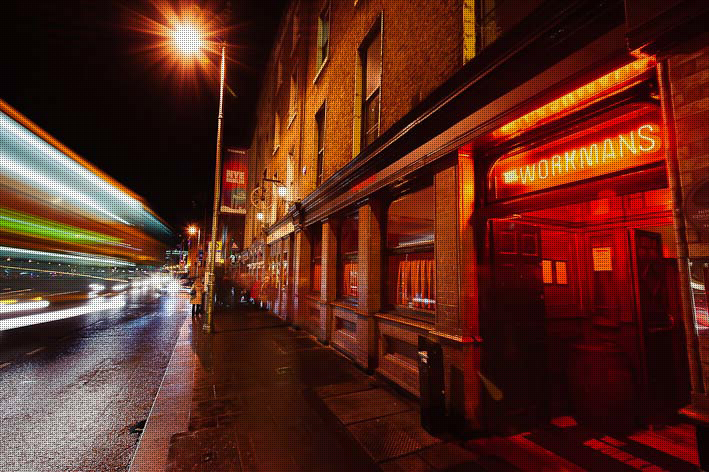 The proud winner of a Hot Press/IMRO Live Music Venue of the Year Award, The Workman’s Club looks forward to seeing you soon for tunes and pints.